COVENS - L'Hemisphere Meridional pour voir plus distinctement les Terres Australes. COVENS, J. / MORTIER, C. - L'Hemisphere Meridional pour voir plus distinctement les Terres Australes. L'Hemisphere Meridional pour voir plus distinctement les Terres Australes. - COVENS, J. 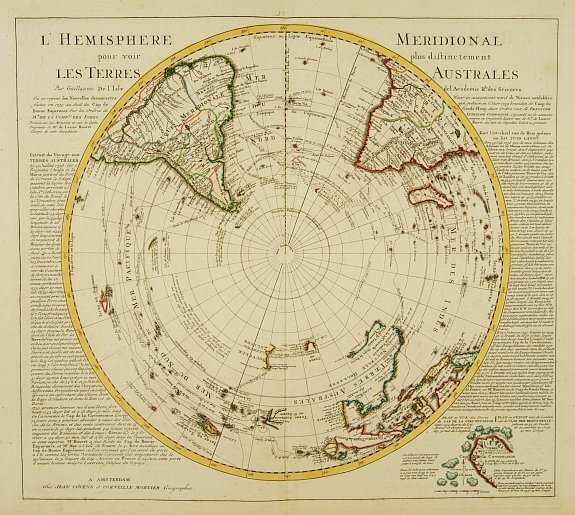 / MORTIER, C.
Title : L'Hemisphere Meridional pour voir plus distinctement les Terres Australes.. Date : Amsterdam, c. 1745. Size : 18.5 x 20.7 inches. / 47.0 x 52.7 cm. Description :Decorative map depicting from the southern pole to the Equator with good detail, and showing all the political divisions. Showing South America, southern Africa, the west coast of Australia, part of New Zealand and the Pacific islands and the southern oceans. Presents explorers' and circumnavigators' tracks around the southern oceans including Magellan in 1520, Abel Tasman in 1642, and Edmund Halley in 1698-1700. The map provides very good detail, particularly of the discoveries in Australia, New Zealand and the South Pacific. With letterpress text written in French and Dutch on left and right margins. The map is from a Dutch edition of De L'Isle's work entitled, Atlas Nouveau, Contenant Toutes Les Parties Du Monde, Ou sont exactement Remarquïées les Empires, Monarchies, Royaumes, Etats, Republiques &c. Par Guillaume de l'Isle. Premier Géographe de sa Majesté. It was published by Covens and Mortier, brothers-in-law who continued the firm established by Pierre Mortier. Condition : Original outline hand colouring on heavy paper, slightly age-toned. Good margins. Minor brown spotting. Very good condition.